Achieve calm, manageable and healthy-looking locks with the Mane 'n Tail Deep Moisturising Shampoo; a replenishing, regenerating formula that works to cleanse and hydrate dry hair. The shampoo is good. 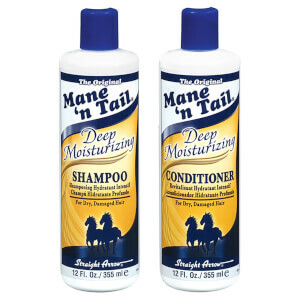 First I tried the original Mane n Tale Shampoo and was very happy with results however since my hair is dry and curly I decided to try the Deep Moisturising version. I like the resuls however think that like more the original one.